ICV was live webcasting in San Diego California for a Corporate Townhall meeting Webcast. 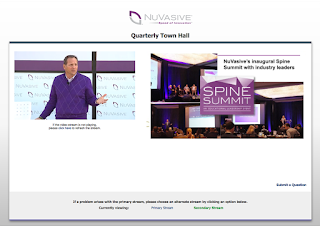 The 2016 Q4 Townhall webcast at Nuvasive. Setting up outside the Nuvasive headquarters in sunny San Diego, ICV provided HD Production, secure streaming players and video streaming portal web development as well as the entire live webcasting process. Nuvasive chose ICV from dozens of webcasting companies in San Diego. To support Nuvasive's expanding corporate communication efforts. ICV was chosen due to the breadth of our webcasting services. Using our ICV Media Portal, clients build a library of past events we've webcast for them. Users can login to the secure portal and review events or educational and training videos they've missed. ICV Live webcasting services brings their far flung workforce together for important discussion and interaction. Live webcasting maintains a high level of awareness and consistency within your workforce.